Through mutual contacts, Daley managed to reach out to Letts. Initially the motivation was simply to dig deeper with his research. Few could have predicted to what extent Letts would become involved in Nicholas’ work, from inspiration to co-conspirator, Letts modelled for both Daleys’ SS15 and AW15 collections, this time adding not just his “energy” but also exchanging ideas, imparting his knowledge and history and putting together a mixtape for Daley to co-inside with the AW15 collection, focusing on the artists they both have great admiration for, most notably Bob Marley, a man Letts was lucky enough to call a confidante after meeting at his famous gig at Lyceum London. Daley sweetly describes the friendship with Letts, which looks set to continue collaboratively beyond AW15, as a “positive harmony”. In your opinion, what is it about Letts that inspires so many creatives within the industry? Nicholas Daley: Don will always be an influential figure for youth culture in Britain because he channels his experiences and history. And he continues to collaborate with a variety of people and is always willing to work with creatives, like myself. He’s told me, “It’s all about passing it on.” I can remember Don telling me how fashion came to him when he was working at ACME attractions on the Kings Road in the 70s. There are some great images of Don there, wearing a variety of different styles, which give real insight into how he was expressing himself. To see him in my garments brings the project full circle. What other words of wisdom has he imparted on you? For your AW15 collection you looked to a lot of images of skinheads and Afro-Caribbean communities in the 70s, was this a continuation from your SS15 collection? Nicholas Daley: It felt very much like a natural progression from my SS15 collection, but looking deeper into my own cultural heritage, which led me to focus on these two subcultures. I want my inspirations to be a true extension of myself – to make my work as authentic as possible. Which photographers did you look to when researching these tribes? Nicholas Daley: Gavin Watson, Colin Jones – I found his book The Black House whilst studying at CSM. It was a great inspiration as he recorded the lives of the Afro-Caribbean community during the 70s on Holloway Road. I spoke with Dennis Morris on a few occasions and he expanded on the stories behind his images. This first-hand research really helped me in creating a story. Don was, of course, a huge part of this scene, and both subcultures. DJing at The Roxy meant he got to know all the punk bands and skinheads – Don is a cultural icon. He was at the forefront of the punk and reggae scene in 70s Britain and instrumental in introducing dub and reggae to the first wave of the punk movement. To me he is a great example of someone who has lived through pivotal moments in the history of the UK. Subcultures traditionally had a political context. Is it the merging of these two contrasting subcultures that inspires you? Nicholas Daley: The first wave of skinheads in Britain during the 60s embraced and acknowledged the fashion and lifestyle of the first post war immigrant Afro-Caribbean communities living in Britain. Black and white youth came together under an umbrella of music and style. This cultural harmony is something very important to me, to who I am. Do you think subcultures and style tribes still exist? Nicholas Daley: With the pace of things today it seems as if different styles and subcultures are now blurred together. We live in an age where anyone can access anything at any time and it is becoming harder to tell the difference between the original and the mimicked. But as long as there is ‘mainstream’, a counter culture will always exist. I suppose its about conformity and rebellion. How have you translated these tribes in the new collection? Nicholas Daley: There are subtle references of my research in the garments I have designed, such as with the styling – the cropped jean which finishes just above the boot and the wide lapel jackets specifically hint at a 70s feel. I used British corduroy and denim, both of which fabrics were of the most fashionable of the 70s. Why do you feel very strongly about using British fabrics and manufacturing within the UK? Nicholas Daley: I think the fashion industry has become very fast-paced, creating garments which go that extra mile on quality and detail is an important part of my ethos and the way I want my brand to grow. I want to make garments which will last a long time and grow with the wearer rather than be thrown away. The main setback to using British production is the cost, which can never compete with Asia. Nicholas Daley: Creating an authentic story. I have enjoyed developing and seeing my AW15 collection come together, watching the many different components [unite]. The collaboration with Don, working with British mills and factories, referencing my cultural history. Through my garments I am creating my authentic story. Visit www.nicholasdaley.net / @nicholas_daley. 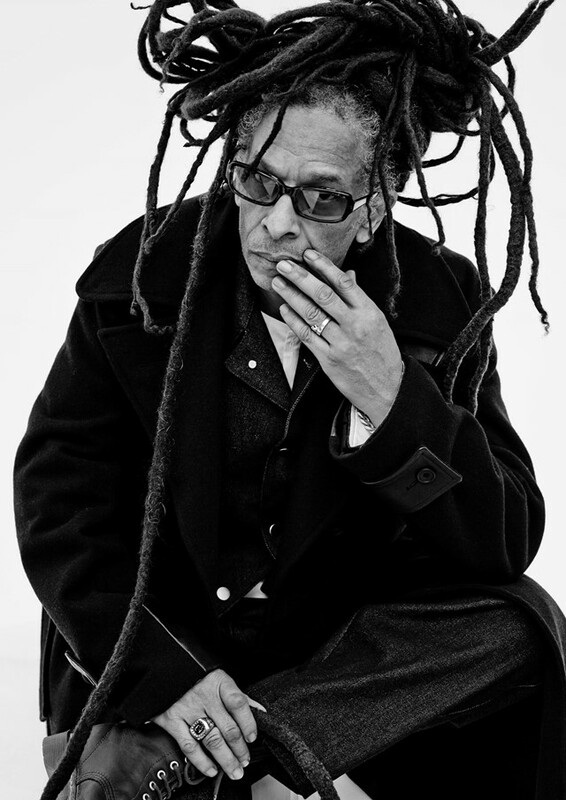 You can catch Don Letts DJing at festivals including Glastonbury and Latitude this summer. His 'Culture Clash Radio' show goes out every Sunday 10-12pm on BBC 6Music (available any time online).